When you think of promoting healthy body acceptance, the first thing to come to mind probably isn’t putting Barbie in a bunch of swimsuits and parading her around in ads and other marketing materials. But now that the iconic doll comes in a variety of body types, that’s just what Target is doing to publicize its 2016 swim collection. 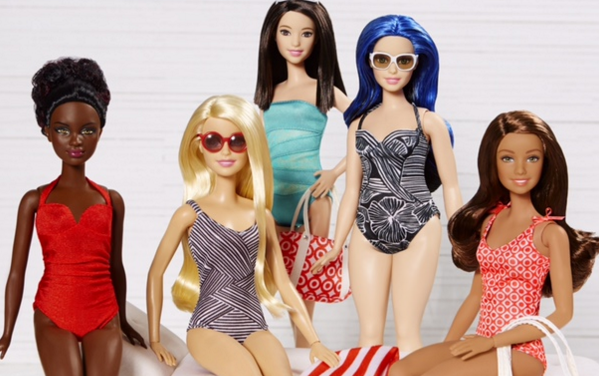 Target announced Tuesday that in an effort to eliminate body insecurities — and sell a few swimsuits — it’s using Mattel’s revamped doll line to showcase its designs. “As part of our 2016 swim campaign, we’re encouraging guests on social to tag #NOFOMO (no fear of missing out! ), which is all about shaking off body insecurities and not letting anything get in the way of having fun in our swimsuits,” the company said. Of course, Mattel is also hoping to get a sales boost out of this partnership. It just so happens that the new campaign is announced on the same day the more realistic Barbies hit Target shelves.